Throughout the world today Shaolin Culture (Chin. : Shàolín Wénhuà 少林文化) is most commonly propagated by Warrior Monks (Chin. : Wǔsēng 武僧). These monks utilize the vehicle of Warrior Skills (Chin. : Wǔgōng 武功) to spread the Shaolin Tradition (Chin. : Shàolín Xiāngchuán 少林相传). They are the class of monks seen most often by visitors to the temple and by people around the world who take part as students in their classes. The Shaolin Warrior Monk tradition has not always been a part of the temple. However, it has only been revived recently. 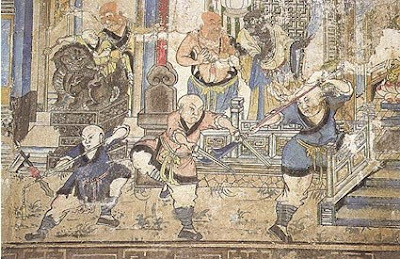 The origins of Shaolin Wuseng are in fact much older. The predecessors to the Wuseng were the Monk Soldiers (Chin. : sēngbīng 僧兵). The origin of the Sengbing is usually said to be found in the Tang Dynasty (Chin. : Tángcháo 唐朝, 618-907) with second emperor Li Shimin (Chin. : Lǐ Shìmín 李世民). The story, in brief, tells of a struggle for power which took place between Wang Shichong (Chin. : Wáng Shìchōng 王世充) who was a rebel of the fallen Sui Dynasty (Chin. : Suícháo 隋朝, 581-617) and opponent of the early Tang, and the founders of the newborn Tang Dynasty. Wang Shichong, stationed near Luoyang (Chin. : Luòyáng 洛阳), had overthrown the first Tang emperor and established his own state which had taken control of the Henan region (Chin. : Hénán 河南), including the area around Shaolin Monastery (Chin. : Shàolínsì 少林寺). In 621 he led a battle against Tang prince Li Yuanji (Chin. : Lǐ Yuánjí 李元吉) and had just defeated him. However, at this critical moment head monk Zhi Cao (Chin. : Zhì Cāo 志操), one of 13 Shaolin monks armed with sticks, appeared from a mountain pass behind Wang Shichong's troops. Zhi Cao led a surprise attack which threw the rebel troops into confusion and General Wang's nephew, Wang Renze (Chin. : Wáng Rénzé 王仁则) was captured and sent to the Tang camp. Wang Shichong, eventually surrendered himself. Inside the Shaolin Monastery there is a stone tablet (Chin. : shíbēi 石碑) personally inscribed by second Tang emperor, Li Shimin, which honors the Shaolin monks for their aid in subduing the rebels and subsequently allowing for the most glorious dynasty in China's history to effectively begin. In gratitude to the monks' service, Li Shimin gave a gift of land to the temple and officially granted them permission to train a unit of armed soldiers who could protect the temple and serve the dynasty when called upon. The monks of this new unit were called "Sengbing" (monk soldiers). They were allowed by the emperor to take fewer precepts which did not bind them to the monastic rules of the fully ordained monks. This was the beginning of a tradition and new class of monks unique to Shaolin Monastery. Shaolin Wugong began to develop more through them during the Song Dynasty (Chin. : Sōngcháo 宋朝， 960-1279), with much help from Emperor Zhao Kuangyin (Chin. : Zhào Kuāngyìn 赵匡胤) and his generals who added their best knowledge and material to the Shaolin system. Then during the Yuan Dynasty (Chin. : Yuáncháo 元朝, 1279-1368) Shaolin Abbot Xueting Fuyu (Chin. : Xuětíng Fúyù 雪庭福裕, 1203-1275) added great contributions to the Wugong system when he invited many masters throughout the land to share their knowledge with the Sengbing at Shaolin Monastery three times for a period of three years each. The Ming Dynasty (Chin. : Míngcháo 明朝, 1368-1644) was the greatest flourishing period in which the Sengbing were highest in number. 500 were responding to imperial decree to protect against the Japanese pirates (Chin. 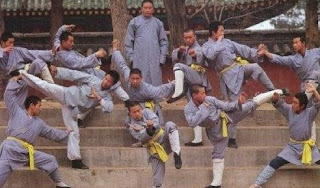 : wōkòu 倭寇), and over 1,000 more were reserve forces in Shaolin Monastery. A new TV series in China entitled "Shaolin Sengbing" came out in 2008 telling the stories of this period, with such famous monks as Yuekong (Chin. : Yuèkōng 月空) who led the Sengbing to defend against the Japanese. In the Qing Dynasty (Chin. : Qīngcháo 清朝, 1644-1911) Shaolin Monastery was accused of being anti-Qing with the common slogan "overthrow the Qing, restore the Ming" (Chin. : Fǎn Qīng fù Míng 反清复明), and thus the imperial court repeatedly issued edicts prohibiting Wugong training. The Sengbing unit then began to gradually decline, and the remaining had to practice in secrecy. At the start of the Republic of China (Chin. : Mínguó 民国, 1912-1949) the value of Shaolin Wugong began to recover. Abbot Shi Henglin (Chin. 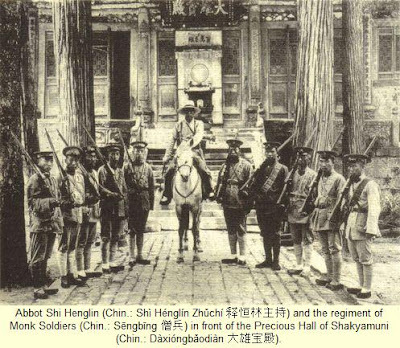 : Shì Hénglín 释恒林, 1865-1923) at that time began to lead a small regiment of Sengbing once again. They held off gangs of bandits in the local vicinity, but it was not enough to defend against the 1928 attack and burning of the temple by warlord Shi Yousan (Chin. : Shí Yǒusān 石友三). After the establishment of the People's Republic of China (Chin. : Zhōnghuá Rénmín Gònghéguó 中华人民共和国, 1949) the government's religious policy changed and traditional sports were reinstated and further developed. In 1979 to continue the tradition of the Shaolin Monk Soldiers, the Shaolin Monastery set up the Shaolin Wugong Team (Chin. : Shàolín Wǔgōngduì 少林武功队), to be the "dissemination team" (Chin. : xuānchuánduì 宣传队) for the temple- performing Wugong to create interest in the Shaolin Culture and spread the Dharma (Chin. : Fófǎ 佛法). In 1989 they then formally changed the name to "Shaolin Monastery Warrior Monk Regiment" (Chin. : Shàolínsì Wǔsēngtuán 少林寺武僧团). Today there are still Wuseng in Shaolin Monastery. However, although they are the main propagators of the Dharma outside of the temple and around the world, they are still far outnumbered by the fully ordained monks (Chin. : Héshang 和尚) in Shaolin. The current estimation is some 300 monks in total, over 200 of which are Heshang, while only 100 or so are Wuseng. The Wuseng being doubled in number by the Heshang should tell us the heart of Shaolin practice- the Dharma. Shaolin Wugong is only a very small piece of true Shaolin Culture and has the Dharma as its center. Wugong attracts many people and some come to understand Dharma through it, yet there are many who never see the broader picture. To further muddy the water there have been "fake monks", not only recently but even hundreds of years ago. In the Song Dynasty Emperor Zhao Kuangyin, who had previously studied at the temple, sent several of his generals to Shaolin in order to teach the Sengbing their most effective combat methods, creating a boxing set (Chin. : tàolù 套路) called "Great Ancestral Long Boxing" (Chin. : Tàizǔ Chángquán 太祖长拳) to be used as a "testing set". This way they could determine who was actually from Shaolin by testing them with this set. If they didn't know it they were fakes. In recent years the Shaolin Monastery placed trademarks on the Shaolin name in order to protect it from misuse. There were a number of fake performance monks (Chin. : biǎoyǎnsēng 表演僧) who had nothing to do with the temple, using Shaolin Wugong to make money. There were even companies selling "Shaolin Sausages". Shaolin Monastery's fame has been taken advantage of by many and in a variety of ways, and obviously those actors do not follow the Vinaya (monastic codes of conduct) (Chin. : jièlǜ 戒律). All of this has sullied the image of Shaolin in recent years. Perhaps even more so is the basic misunderstanding and lack of knowledge concerning the Wuseng, their level of precept and place in the temple. (Read up on it here: Shaolin Monasticism & Discipleship) One's preconceived notions concerning the Wuseng, falsely seen as fully ordained monks and what that entails, creates all sorts of unwarranted negativity toward them (especially if even the fake monks are assumed to be fully ordained Sangha members). Hopefully these articles can serve as references to the true tradition and allow more people the opportunity to understand. Shaolin's name can then be vindicated. All one has to do is look at the true monastics of Shaolin in the proper way according to their precept level and position. Master Shi Deyang (Chin. : Shì Déyáng 释德扬) emphasizes the importance of not forgetting the heart of Shaolin. He says fortunately the days of "guarding the family and protecting the home" (Chin. : kānjiā hùyuàn 看家护院) are gone. We no longer need to practice Wugong out of necessity for survival. Nowadays we use it as a method of Buddhist practice (Chin. : xiūxíng fāngfǎ 修行方法) and to exercise the body (Chin. : duànliàn shēntǐ 锻炼身体). One must remember when seeing the Wuseng perform, when learning from them, or when practicing Shaolin Wugong that the heart of it all is Chan (Chin. : Chán 禅). The group of Wuseng performers nowadays demonstrate Wugong in an alluring mesh of historical legends intertwined with Buddhist philosophy to show the deeper meaning. Try not to see only the skin. There may be people who exploit the temple. There may be people with shaved heads, Buddhist robes, and beads around their necks and wrists who do not follow the Dharma or Vinaya. This does not however hurt the case for those who know the truth. If we honestly want to practice, just practice honestly. This is what the tradition of the Shaolin Wuseng is about. "Guarding the family and protecting the home" may not be such an urgency in our times. However, we must all become warriors fighting to guard the mind and protect the heart. The most difficult enemy to overcome has always been one's self. Thanks again for another wonderful article on Shaolin. With all these "shaolin monks" touring the world one might forget what shaolin temple really is about. A Buddhist temple! But in a way they help promote shaolin (buddhism) be they monks or not. Most of them aren't even buddhists. Looking forward on more about Shaolin and/or Buddhism. I was wondering though if you might know if there are also nuns practising (shaolin) kungfu in China. So far I could not find anything about women practising buddhism and kungfu in any temple in China. Thanks for your kind words. It is a good observation. As long as people are willing to look more deeply, they will be able to understand. Nearby Shaolin Monastery there is the "Shaolin Nunnery" called Yongtai Monastery (Chin. : Yǒngtàisì 永泰寺). It has a very long history as well and today there is also an all-girl school there. I will introduce it and some other surroundings soon.